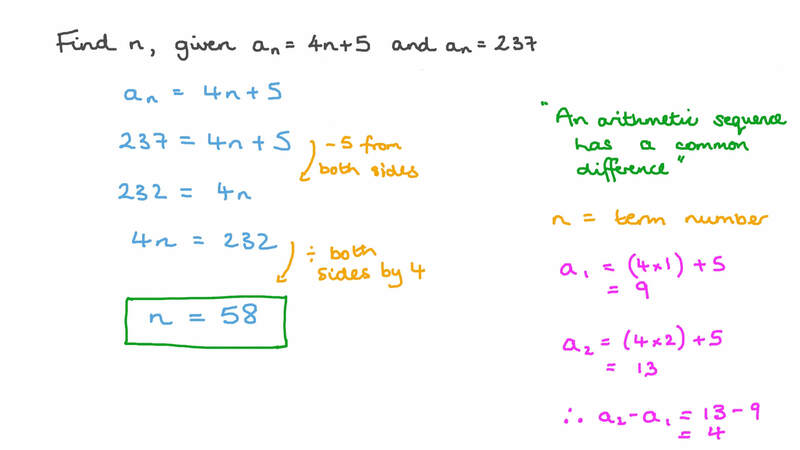 In this lesson, we will learn how to calculate the common difference, find next terms in an arithmetic sequence, and check if the sequence increases or decreases. Write the next three terms of the arithmetic sequence 1 5 . 8 , 1 4 . 6 , 1 3 . 4 , 1 2 . 2 , … . Using the table, determine the expression that represents the value of each term as a function of its position. Then, find the value of the fifteenth term in the sequence. Write the next three terms of the arithmetic sequence 1 6 1 , 1 5 2 , 1 4 3 , 1 3 4 , … . Write the next three terms of the arithmetic sequence 3 . 3 , 4 . 2 , 5 . 1 , 6 , … . Find 𝑛 , given 𝑇 = 4 𝑛 + 5 𝑛 and 𝑇 = 2 3 7 𝑛 . Find the first five terms of the sequence whose general term is given by 𝑇 = 4 𝑛 + 1 𝑛 where 𝑛 ≥ 1 . Write the next three terms of the following sequence: 3 1 , 5 7 , 8 3 , 1 0 9 , … . If the multiples of any number are written in increasing order, do they form an arithmetic sequence? Given that the sequence 𝑎 , 𝑎 , 𝑎 , 𝑎 , … , 1 2 3 4 is arithmetic, which of the following statements is true? The ending balances in Yara’s savings account for each of the past four years form the sequence 800, 850, 900, 950. Is the sequence arithmetic? Determine the 81st term in the arithmetic sequence which starts 5 1 , 1 0 2 , 1 5 3 , 2 0 4 , … . Use words and symbols to describe the value of each term as a function of its position. 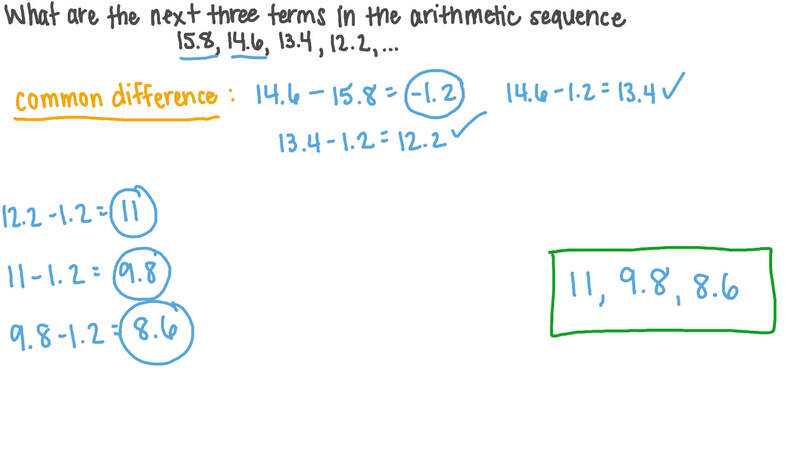 Then, find the value of the eighteenth term in the sequence. 26 28 30 32 ? 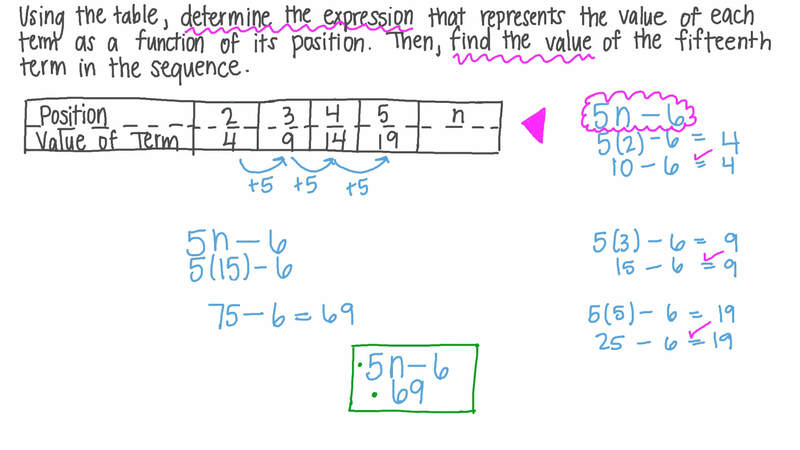 Create a five-term sequence by starting with the number 67 and subtracting 8 from each term. The table shows the number of puzzles Yara finished in a number of weeks. If she continues this pace, write an algebraic expression that can be used to determine the total number of puzzles she would finish after any given number of weeks. How many puzzles will Yara have finished after 43 weeks?